Note: Climate regions based on Department of Energy Building America climate regions. Data from the 2015 Residential Energy Consumption Survey (RECS) show that the majority of American households use one of three types of equipment as their main source of heat during the winter: natural gas furnaces, electric furnaces, or electric heat pumps. The range of equipment and fuels, however, varies across and within U.S. climate regions. The use of secondary heating sources, such as portable electric heaters and fireplaces, further adds to the diverse ways households consume fuel to stay warm in the winter. Broad ranges in winter temperatures and capabilities of different technologies mean that certain heating choices are better suited to certain climates. Overall, 47% of households rely on natural gas as their main heating fuel, compared with 36% who rely on electricity. Natural gas furnaces are the most common main space heating equipment used in every climate region except the hot-humid region of the Southeast, where heating needs are lower and electric furnaces are more prevalent. In the mixed-dry/hot-dry climate region in the southwestern United States, 15% of homes do not use heating equipment at all, compared with the national average of 4%. Electric heat pumps are well-suited to the relatively mild winters in hot-humid areas and some mixed-humid areas. Of the 12.1 million households that use electric heat pumps, 9.3 million are in these two regions, which cover much of the Southeast. The high cost of electric heating in colder climates has often limited the use of heat pumps and other electric equipment in those areas. However, advances in heat pump technology, including cold-climate heat pumps, have enabled more efficient electric space heating in areas with lower winter temperatures. In 2015, 1.3 million households in the cold/very cold climate region had electric heat pumps, or about 3% of the regional total. Other fuels, such as distillate fuel oil and kerosene, are more commonly used for space heating in the cold/very cold region, but the use of these fuels continues to decline. In the 2015 RECS survey, 5.9 million homes in the United States reported using fuel oil or kerosene as their main heating fuel, a 20% decline from the results of the 2009 RECS survey. Nationwide, 37% of U.S. households supplement their main equipment with a secondary source of heat. Almost half of these households use portable electric heaters, the most common secondary heating choice in every climate region. Fireplaces using natural gas or wood are the next most popular choices. Some households use furnaces or heat pumps as their back-up heating source, equipment types that are more commonly used as the main source of heat. 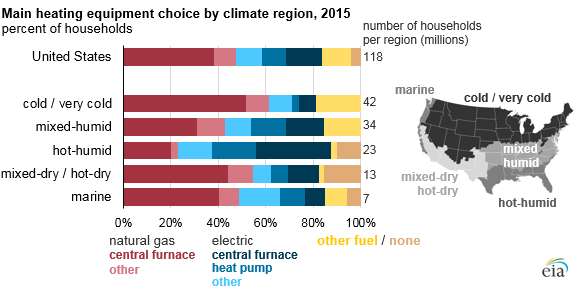 When considering both main and secondary heating equipment and fuels, U.S. households choose a diverse set of heating scenarios. Among the 5,687 households that were surveyed in the 2015 RECS, EIA observed over 150 unique combinations of heating equipment and fuels. More information on household energy use is available in the RECS Housing Characteristics tables.